Our 1944 Vancouver Public Library image description says it shows the McLachlan Building – New England Hotel. The architect of the hotel was Fred Peters, an American who was mostly active in Seattle, but who practiced in Vancouver for a while when the boom of the early 1910s saw the city take off. This appears to have been the biggest commission he received, although he designed at least one $15,000 home in West Point Grey. He returned to the city in the 1920s when he was the supervising architect for the Orpheum Theatre’s construction. The New England Hotel was described in the Daily Building Record in 1912 as “Apartments/rooms; four-storey brick & mill construction store & rooms; wall built to carry two additional stories. Steel beams across store w/ pressed brick & terra cotta face”. It cost $70,000 and the owners were shown on the permit as D J and N S McLachlan. One of Fred’s few Vancouver commissions was to design a $2,000 garage for D McLachlan in South Vancouver in 1913. Dugald James McLachlan (listed in 1912 in the street directory as Dougal) was 46 when the hotel was built, living with his wife Mary Ellen and son (also Dugald James). Both Dugald and Mary were born in Ontario. He was shown as a merchant, living on Chilco Street, a partner in McLachlan Brothers who that year sold hardware, stoves and grates at 878 Granville Street. His brother, Charles McLachlan was listed as the other partner. Charles was at least ten years younger than Dugald. By 1913 Dugald was associated with the Scoullar Sheet Metal Co, who had premises on Hamilton Street. Ralph and Edwin Scoullar worked there, and Dugald was a partner with Edwin in running the business. Thomas Hooper had designed a $25,000 warehouse on Hamilton Street for McLachlan Brothers in 1911, and Charles McLachlan was still shown involved in the retail business in 1913, so it seems that the brothers diversified, retaining the hardware business and adding the sheet metal operation. The third brother, Donald Stewart McLachlan who was living in West Point Grey in 1914 was also part of McLachlan Brothers, with Charles. He was two years younger than Dugald. As we can’t find any N S McLachlans in the city, we suspect one of the two brothers was Dugald’s partner in building the New England, and the initials ‘N S’ were inaccurate. A July 1912 newspaper report suggests it was D S McLachlin who was the partner. Before their move to Nelson,, Donald and Dugald worked for Vanacouver Hardware in Vancouver. In 1895 they were living at the same address, with D J as a clerk and D S a salesman. That year Dugald married Mary Ellen Allen, who was the daughter of a contractor born in Madoc, Ontario. The brothers were brought up in Horton, Renfrew County, Ontario. Dugald died in 1931, and Mary a decade later. The New England was initially leased as rooms, rather than a hotel, and Alex Audet ran it. We’re not sure whether the VPL title identifies the McLachlan Block as being different from the New England Rooms – as far as we can tell it’s the same building, but it’s possible that they also developed the smaller building at 648 Seymour: we haven’t found any reference to that being built. The New England in the 1950s became the Bay Rooms and then the Bay Hotel. It was replaced by the Bay Parkade in 1959. Today it’s called The Electra, and it’s a mix of condo residential and commercial units. It was converted from an office building in 1995, and had to have a new skin as offices generally don’t have opening windows, but that’s a requirement for residential space. The building was completed in 1957 as BC Electric’s new headquarters. The office was stunning in its setting when it was developed; over 20 storeys, every window lit up every night, surrounded by low-rise commercial buildings and decades old wooden houses. Built by John Laing, it was designed by Ned Pratt with Ron Thom of Thompson, Berwick, Pratt, and the flattened lozenge shape was a result of the client’s requirement that desks should be no more than 15 feet from a window, for natural light as well as the view. Leslie Sheraton’s picture was shot in 1958, when the buildings on Burrard Street included a car dealership; Sherwood Motors, offering Willys 4-wheel-drive and jeep, as well as English Rover, Humber, Nash and Hillman cars. There was also a White Spot, still owned at the time by Nat Bailey, and offering the latest innovation – ‘Take Home Chicken Dinners – just Heat and Serve”. Artist B.C. Binning’s blue, green and black mosaic tiles were an integral part of the building’s design, and were carefully preserved when the conversion to residential and office condos was carried out, designed by Paul Merrick Architects. During that conversion the Hornby Street side of the building was given a far more animated façade. Todat Peter Busby’s Wall Centre tower is much taller, behind the Electra from this angle, and Electric Avenue is in front, a 456 unit condo building designed by Rafii architects and completed in 2005. The complex also has a multi-screen Cineplex movie theatre and retail stores (mostly restaurants). The White Spot was replaced in 1983 with a 71 unit condo building designed by Eng and Wright. Tucked in behind the street trees, the two storey 1938 car dealership is still there, repurposed as a Denny’s restaurant and retail uses decades ago. This 1895 image shows the first location of the city’s first fire hall. The City of Vancouver owned the site because before the 1886 fire the police house was located here, with the jail alongside and set back from the street. Some years after this picture, when the replacement fire hall was built on Cordova Street, the name went with it (so it retained the name Firehall #1, in a different location). The first engine was manufactured in Brussels, Ontario, with the name plate ‘M A MacLean,’ the name of the city’s first mayor, on the engine when it arrived. Among the people posing in 1895 were the fire chief, Chief Carlisle and William McGirr. The brand new City of Vancouver were only too aware of the threat of fire to their newly established city. There were were discussions in Council at the first meeting in May 1886 about equipping the fire brigade, and telegrams had been exchanged with Mr. Ronald, a manufacturer of fire equipment in Ontario, but the confirmation to purchase was only made at the first Council meeting eight days after the fire, on 22nd June 1886. The order was for a 5,000 pound Ronald steam pumper with four hose reels and 2,500 feet of 2 and 1/2 – inch hose that cost the city $6, 905. It arrived in Port Moody in July 1886, where the rail line ended at the time, and it was dragged by a team of horses through the forest to Vancouver. That’s the engine on the right with its steam powered pump. The engine was eventually pulled by a team of horses, but those weren’t acquired for eight or nine months, and initially the firemen had to manhandle it to a fire, which was slow, and meant that the first serious blaze at Spratt’s oilery, a barge previously used to process fish for oil, had burned before they could get the pump into position (although they did ensure sparks from the fire didn’t catch anything else alight). For the Firehall needed to house the shiny new engine, more money had to be raised – but not nearly as much as it took to buy the engine. On July 26th 1886 it was agreed that “a Fire Hall be at once erected 24 x 30, 2 stories high, the 1st story to be 12 ft Clear and the 2nd 10 feet with a tower 55 feet high and 6 feet square on top and that the City Engineer be instructed to prepare plans and specifications so that tenders may be asked for at once. We would also recommend that a Fire Bell be purchased at once the cost not to exceed one hundred dollars”. On August 30th Council agreed to accept the tender of A.D. McKenzie to build the hall for $743.00. The fire brigade moved to their new hall on Cordova Street around 1907, and for a while it looks as if their old premises were re-purposed for retail uses. In 1908 Jacob Cohen had a clothing business where the firehall had been, in a block that had several other Jewish merchants including Maurice Goldberg’s clothing store next door and Zebulon Frank’s secondhand store a little further up the street. The address disappears by 1914, and we suspect the site was cleared. In 1930 the Nagle Brothers Garage was built here, designed by McCarter & Nairne. It was developed by Ed Baynes of builders Baynes and Horie, and was probably the city’s first parking garage. 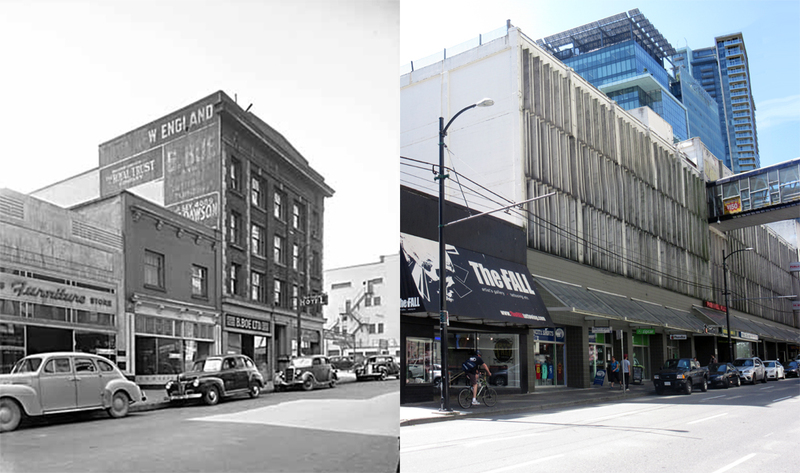 In 1972, the Garage became one of the first rehabilitation and adaptive re-use projects in Gastown, converted to retail and office space by architect H Tanner. An inner courtyard was created, surrounded by balconies and trees. Redeveloped again in 2009 as ‘Garage’ – one of four building restored and added to by Acton Ostry Architects for the Salient Group. Garage was the youngest of the buildings and the redevelopment added three extra residential storeys, with no setback (because of the poured-in-place construction of the original building) but with a clear delineation of the original cornice. When this building was constructed Main Street had just changed its name from Westminster Avenue. Located close to one of the city’s breweries, while today we think of it as a pub when it was built it was a retail building. Braunton and Leibert designed it, completed in 1913 for Dr. Israel Powell, one of the province’s important pioneers. He was born in 1837 in Port Colborne in Simcoe, Ontario, and drawn by the Cariboo Gold Rush reached Victoria in 1862 via the Panama Canal and San Francisco. He never went to look for gold, but like his father, Dr. Powell became involved in politics. He was elected to the House of Assembly of Vancouver Island in 1863, but failed to be re-elected in 1866 and 1868. He supported the merger of Vancouver Island and British Columbia, and later Confederation. Sir John A Macdonald was a family friend, and offered him the position of lieutenant governor of B C, or as a Senator. He declined both, but agreed to become Superintendent of Indian Affairs for British Columbia, a position he held for 18 years from 1872. He was surgeon for the Victoria fire department and also served in the militia, while building his medical practice. He was also instrumental in establishing the first Scottish Rite Masonic Lodge in British Columbia. From 1871 to 1875 he was the first grand master of the Grand Lodge of British Columbia, which brought together the lodges under English and Scottish jurisdictions, although later, in 1877, he severed his connections with the masons. Although he lived in Victoria, he owned property in Vancouver from its inception, and was on the initial voter’s list. He was part of an early consortium with David Oppenheimer and others who bought land in 1886, and was also a shareholder in the Vancouver Improvement Company (a larger group with many of the same owners) who eventually owned 330 acres of Downtown land and helped ensure their increased value with the arrival of the Canadian Pacific Railway into the city. At his death in 1915 he had investments in farms in the Fraser Valley, on Vancouver Island including the Hotel Wilson of Victoria, as well as in buildings and lots in Vancouver and North Vancouver. The names of several places in British Columbia, commemorate Dr. Powell, including Powell Street in Vancouver and Powell River. This building was completed only two years before his death when he was in his mid seventies, and cost $47,000 to build. As far as we can tell it represents Dr. Powell’s only investment in bricks and mortar in the area, but according to the Heritage Statement for the local plan, he had acquired and named the streets of most of the area we associate as Mount Pleasant (with Henry Edmonds). It states that it was Dr. Powell’s idea to name the streets after the Canadian Provinces, although Mount Pleasant was a name chosen by Edmonds. Our 1940s image show the retail unit occupied by a Fur company, while in 1976 it was Royal City Antiques. Over the years the retail uses have changed many times – today it’s a bike store and a dounut shop. The upper floors of building haven’t really changed much since it was built in 1909. According to the building permit it cost $20,000 and was designed by A J Bird for J Seabold. (The Contract Record said Seabold and Roberts were the developers. We haven’t successfully identified who John Seabold’s development partner was.) In 1991 four dwelling units were converted to retail use, so there are now just 10 apartments in the building, but there were more in this 1924 image. The Daily World, in announcing the development, said “the design will be of classic character”. John A Seabold developed a number of other apartment buildings around the city, including the Empire Hotel on East Hastings, our first post on this blog. 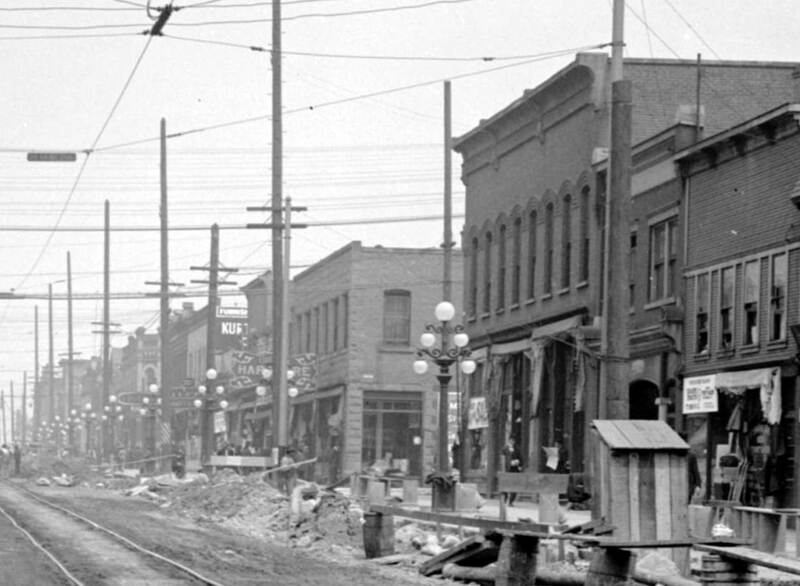 He started out building houses, then apartments, and eventually was in partnership as Seabold and Roberts, building significant buildings for the day including Blenheim Court two blocks further along Davie Street. Seabold was an American, and the source of his success was explained in a story published in an Indiana newspaper in November 1909; the Jasper Weekly Courier, published in Jasper, Dubois County. He was quoted saying that Western real estate “is better than a gold mine”. In 1913 he acquired the Clarence Hotel on West Pender Street. However, Mr. Seabold’s perspective changed quite quickly. Vancouver changed significantly from the city that only a few years earlier had elected a Jewish German mayor with a noticeable accent, David Oppenheimer. A 1917 article in another Indiana newspaper, the Bluffton Chronicle, clarifies a point we’ve noted about several other Vancouver residents during the First World War. If there was any suggestion of German family origins it was wise to change your name or move south. The 1911 Census said that John was from a German family, but had been born in the USA. He was married to Louise, also born in the USA into a German family and they had a son, Ralph aged nine. John and Louise Schwartz were married in Michigan in 1900. They were shown having arrived in Canada in the same year, and appeared as John and Louisa Seabold in the 1901 census, lodging with Minnie Matthias. At that time John was a waiter, while in 1911 he was shown as a builder. 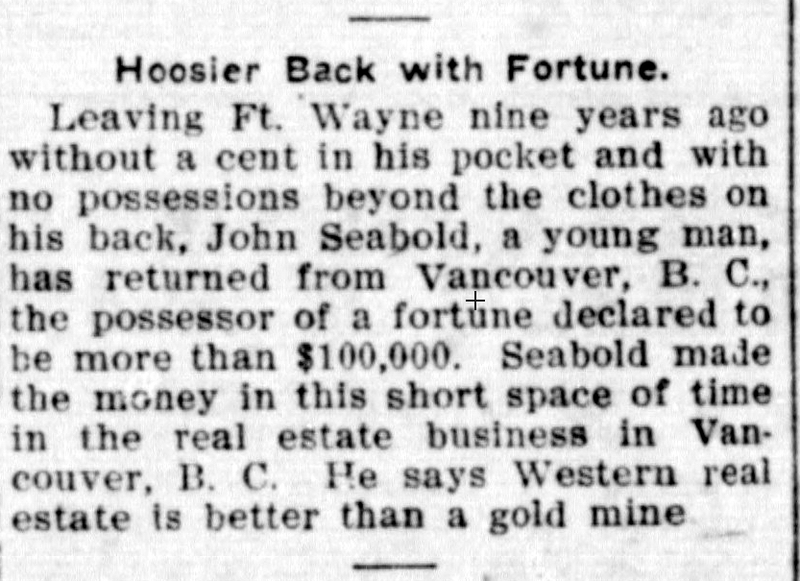 The 1917 news story explains that Mr. Seabold had tried to sell his property, but ‘found this impossible’. That wasn’t necessarily anything to do with Mr. Seabold’s origins – the economy of the city hit the skids around 1913, and the war didn’t improve things. The main reason for heading to the USA was being drafted into the Canadian forces, which would have potentially have seen Mr. Seabold (who was aged 40 when the war broke out), expected to fight in Europe. The newspaper reported that some of Mr. Seabold’s property had been confiscated, presumably as a result of his decision to leave the country. In 1944 Ralph Seabold was married in Los Angeles, and John and Louise were living there in both the 1930 and in 1940 US Census records. They moved south to California in the 1930s; in 1920 they were living in Seattle where John was working as a contractor. Image source: City of Vancouver Archives Bu N324. This part of Main Street has changed a little since Walter E Frost shot the 1972 original. According to BC Assessment records the building on the corner was built in 1954, and its still there today. 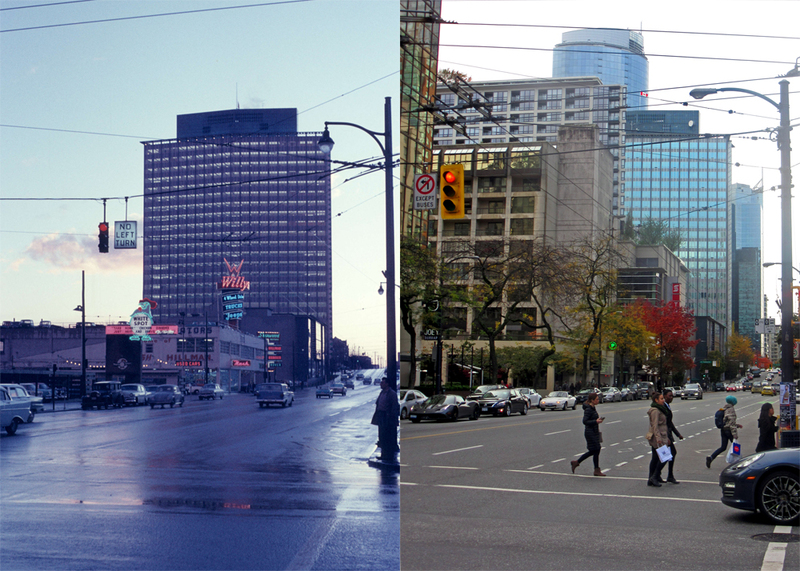 Several other buildings have been redeveloped to the north over the past 40 or so years. The only apparently significant old buildings on the block are on the far left of the picture at the north end; dating back to just after the turn of the 20th century. However, this 1912 image of track laying along the street suggests the building on the corner is actually much older – presumably getting a significant re-build in 1954. The 1903 Building permits show James Main & Co. Hardware, building a $10,000 stone and brick store here, built and designed by J W Balmain, with the design submitted by John Walker. J W Balmain advertised as a civil engineer and architect based in North Vancouver (where he became City Engineer). In 1901 he was apparently lodging in Victoria, where he was described as Scottish, aged 61, and having arrived in Canada in 1889, and he was shown living in Vancouver in the 1891 census, also lodging. John Walker Balmain had been married in Bombay, India in November 1869 to Marion Watson, but there’s no mention of his wife in Canada. They had a son, Marion Watson Chalmers Balmain in 1870, and a daughter, Janet King Smith Balmain two years later, but they seem not to have moved to Canada. John died in 1910. James Main was also Scottish, and confusingly for us there are two people called James Main in the city (fortunately both were Scottish, so that’s accurate). We think its likely to be the one identified as a merchant, aged 40 in 1911 and living in the West End at 1823 Comox Street with his brother, Alexander, (a grocer in 1911, but working with his brother the following year). There were also three sisters in the household, Janet, Anne (who was a nurse) and Margaret. James had arrived in 1890, while Alexander was most recently arrived in 1906 with Margaret, and the other sisters in 1902. James looks to have learned his trade with Thomas Dunn, working as a clerk in Dunn’s hardware store in the 1890s. (There’s another Alexander Main who was also a grocer on Commercial Drive). In 1909 James was a director of a Vancouver-based company planning to introduce the Renard Road Train to Canada. Invented by a Frenchman and developed by Daimler in Britain, the system was sold to Australia, India and Egypt but we’re not sure that it was ever actually introduced into Canada. The carriages were linked and steered through interconnecting rods, and powered with a Daimler 16L engine that powered the middle wheel of each carriage. The last time James Main was in the city was 1914, although Alexander and Janet were both still shown living on Comox Street for several more years. In 1915 the R L Brown Hardware Co replaced Mark Drummond Hardware, who had taken over the James Main business around 1910. That was the year that Westminster Avenue became Main Street – so there never was a Main on Main. It’s not often that we feature our own image for both the ‘before’ and ‘after’ images, and even less often that the ‘before’ is less than a decade ago, but the dramatic transformation of South East False Creek warrants a look. We took the initial image in 2007, long before the BC Place stadium got its new roof. We calculate that there are over 1,100 new apartments in the contemporary image, including 129 in ‘First Place’ the non-market housing building across the lane from the gas station. The picture will change a little more as Concert Properties are developing around 600 apartments beyond the sites that have already been built – one tower crane is just showing on the left. One detail that you can’t make out at the resolution we post these images: in 2007 gas was 108.9c per litre; when we took the current shot (back in April) it was 111.9c.